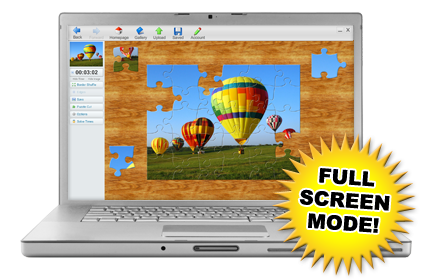 Play thousands of jigsaw puzzles on your desktop. Use your entire computer screen to play with larger, easier-to-see pieces. Please enable Flash to download the Puzzle Player. Adobe AIR 2.5.1 or higher and an active internet connection. 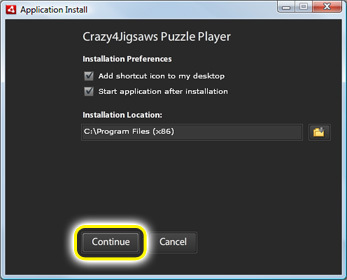 To install the Crazy4Jigsaws.com Puzzle Player application, click on the 'Free Download' button above. If you are prompted to install or upgrade Adobe Air, click 'yes'. 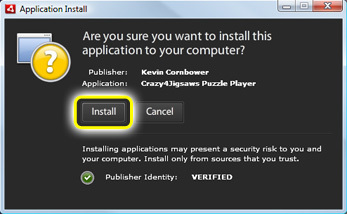 Adobe Air 2.5.1 is required to run the Puzzle Player. When the Application Install dialog is displayed, click the 'Open' option. Next click the 'Install' option. After your application has installed, you can access it by clicking on the 'Puzzle Player' icon located on your desktop.